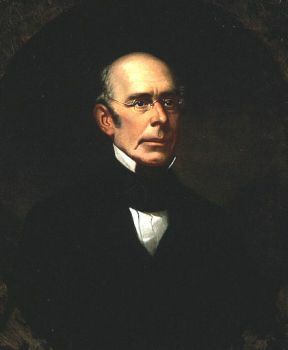 By 1854 William Lloyd Garrison was the most prominent abolitionist in the United States. Beginning with his newspaper, the Liberator, which he established in Boston in 1831, Garrison led the effort to end slavery in the nation. In this 1854 speech which appears below, Garrison called for complete freedom for the slave and urged all Americans to support this cause. I am a believer in that portion of the Declaration of American Independence in which it is set forth, as among self-evident truths, "that all men are created equal; that they are endowed by their Creator with certain inalienable rights; that among these are life, liberty, and the pursuit of happiness." Hence, I am an abolitionist. Hence, I cannot but regard oppression in every form-and most of all, that which turns a man into a thing-with indignation and abhorrence. Not to cherish these feelings would be recreancy to principle. They who desire me to be dumb on the subject of slavery, unless I will open my mouth in its defense, ask me to give the lie to my professions, to degrade my manhood, and to stain my soul. I will not be a liar, a poltroon, or a hypocrite, to accommodate any party, to gratify any sect, to escape any odium or peril, to save any interest, to preserve any institution, or to promote any object. Convince me that one man may rightfully make another man his slave, and I will no longer subscribe to the Declaration of Independence. Convince me that liberty is not the inalienable birthright of every human being, of whatever complexion or clime, and I will give that instrument to the consuming fire. I do not know how to espouse freedom and slavery together. prate of the rights of man …. If the slaves are not men; if they do not possess human instincts, passions, faculties, and powers; if they are below accountability, and devoid of reason; if for them there is no hope of immortality, no God, no heaven, no hell; if, in short, they are what the slave code declares them to be, rightly" deemed, sold, taken, reputed and adjudged in law to be chattels personal in the hands of their owners and possessors, and their executors, administrators and assigns, to all intents, constructions, and purposes whatsoever"; then, undeniably, I am mad, and can no longer discriminate between a man and a beast. But, in that case, away with the horrible incongruity of giving them oral instruction, of teaching them the catechism, of recognizing them as suitably qualified to be members of Christian churches, of extending to them the ordinance of baptism, and admitting them to the communion table, and enumerating many of them as belonging to the household of faith! Let them be no more included in our religious sympathies or denominational statistics than are the dogs in our streets, the swine in our pens, or the utensils in our dwellings. It is right to own, to buy, to sell, to inherit, to breed, and to control them, in the most absolute sense. All constitutions and laws which forbid their possession ought to be so far modified or repealed as to concede the right. But, if they are men; if they are to run the same career of immortality with ourselves; if the same law of God is over them as over all others; if they have souls to be saved or lost; if Jesus included them among those for whom he laid down his life; if Christ is within many of them "the hope of glory"; then, when I claim for them all that we claim for ourselves, because we are created in the image of God, I am guilty of no extravagance, but am bound, by every principle of honor, by all the claims of human nature, by obedience to Almighty God, to "remember them that are in bonds as bound with them," and to demand their immediate and unconditional emancipation …. These are solemn times. It is not a struggle for national salvation; for the nation, as such, seems doomed beyond recovery. The reason why the South rules, and the North falls prostrate in servile terror, is simply this: with the South, the preservation of slavery is paramount to all other considerations above party success, denominational unity, pecuniary interest, legal integrity, and constitutional obligation. With the North, the preservation of the Union is placed above all other things-above honor, justice, freedom, integrity of soul, the Decalogue and the Golden Rule-the infinite God himself. All these she is ready to discard for the Union. Her devotion to it is the latest and the most terrible form of idolatry. She has given to the slave power a carte blanche, to be filled as it may dictate-and if, at any time, she grows restive under the yoke, and shrinks back aghast at the new atrocity contemplated, it is only necessary for that power to crack the whip of disunion over her head, as it has done again and again, and she will cower and obey like a plantation slave-for has she not sworn that she will sacrifice everything in heaven and on earth, rather than the Union? What then is to be done? Friends of the slave, the question is not whether by our efforts we can abolish slavery, speedily or remotely-for duty is ours, the result is with God; but whether we will go with the multitude to do evil, sell our birthright for a mess of pottage, cease to cry aloud and spare not, and remain in Babylon when the command of God is "Come out of her, my people, that ye be not partakers of her sins, and that ye receive not of her plagues." Let us stand in our lot, "and having done all, to stand." At least, a remnant shall be saved. Living or dying, defeated or victorious, be it ours to exclaim, "No compromise with slavery! Liberty for each, for all, forever! Man above all institutions! The supremacy of God over the whole earth!" Josh Gottheimer ed., Ripples of Hope Great American Civil Rights Speeches (New York: Basic Civitas Books, 2003).